Over the years this has become something of a massive project (specially with seven sites total) and I need help getting the latest information on upcoming fireworks displays! If you know of one in your area, or if you’re responsible for putting one on, or you have better details on one than I have, I am begging, pleading, asking you to use the submit form, or drop me a line – via my contact form, on the Facebook page or on Twitter. 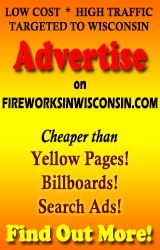 I am dedicated to keeping this the biggest and most comprehensive list of fireworks displays anywhere, but… I’m still kind of new in Wisconsin and not entirely familiar with the geography yet. So I need all the help I can get. Thanks in advance! Note to communities, convention and visitors bureaus and anyone else who puts on a fireworks show or posts events: people are already searching for your events! Please let me know if you’re updating for 2014, or update your website. You’d be amazed how many people start planning their summer vacations in January!